About a year ago I wrote a post about three things I believe every student pastor must do in order to be effective in student ministry. In that post I said that one thing a student pastor must do is build and train a team of adult volunteers. Volunteers are the backbone of our student ministries. Our student ministry is as only good as our volunteers. So I want to write a few thoughts for volunteers in this post. If your a student pastor than pass these along to your volunteers and if your a volunteer yourself than be encouraged and make an effort to do these five things. 1. Follow the leadership of the student pastor. Even though volunteers are key to an effective student ministry they do not take the place of the student pastor. The student pastor needs to drive the ministry, make the big decisions, and have the final word. I have seen too many student pastors get ran all over by a volunteer. If your a volunteer, please humbly follow the person God has placed over your student ministry. Serve students well under their leadership. 2. Grow in their walk with God. This should be number one because it’s the most important thing on this list. Your cannot take students anywhere that you have not been yourself. If you want to help your students grow spiritually than you need to be growing spiritually. A volunteer will not be truly effective in student ministry if they are not growing spiritually. Awhile back I wrote a post on this subject. Your walk with God is the most important thing in student ministry. 3. Be willing to own part of the ministry. A student ministry volunteer will need to accept responsibility and own part of the ministry. The student pastor cannot do everything. For example, the student pastor cannot lead every small group. That’s an area where volunteers will have to own part of the ministry. They will have their small group and should accept that as their ministry. They must follow the leadership of the student pastor and serve students well in that area. If that’s a small group, than lead that group well! If your an event planner, than plan those events to the best of your ability. Whatever area you serve in within the student ministry, do it well and own it! 4. Don’t over commit. Even though a volunteers are key and will own part of the ministry, they need to be careful not to over commit. I have seen many student ministry volunteers that burn themselves out because they are way too over committed. They serve in multiple areas and sacrifice their time, family, and own well being to the point where it’s not healthy. Volunteers don’t get paid to do what they do. So the expectation shouldn’t be the same as the student pastor. Remember, volunteers are volunteers! 5. Love on students. This should be obvious, but as a student ministry volunteer just love on students. Realize the student pastor cannot relationally touch every student in the ministry, but with your help every one of those students can be touched by an adult that loves and cares for them. I am assuming that if someone is a student ministry volunteer that they already love students, but remember that some of the most powerful stories from teens within student ministries come from their interaction with a volunteer. I love my volunteers! I am thankful for them and our student ministry wouldn’t be what it is today without them. Pass these thoughts along to your volunteers and encourage them to serve your students well. Volunteers can be such a blessing. 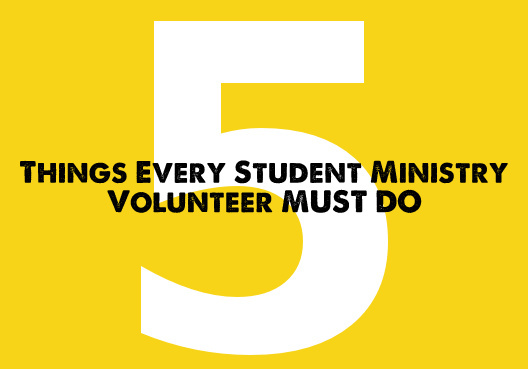 Great list pertaining to the people whose work makes student ministry run! Thanks for the comment man. It’s so true that volunteers are the things that keeps student ministry running! Love what you guys are doing with Leaderteks! Bringing my high schoolers down to Pawyley’s Island in July for one of your mission trips!